This three-mile hike, recommended by one of our readers, provides both views of fall foliage and the Vanderbilt Mansion. Hike the Hudson Valley has detailed instructions for access, and we have some ideas on other ways to spend the day in the Hyde Park area. There are over a dozen marked trails and paths throughout the park—including six miles of the Appalachian Trail—with varying degrees of difficulty. Those who want less of a “woodsy” trek can take the easy path next to Hessian Lake or even walk across the Bear Mountain Bridge for some Hudson River panoramas. In addition to the turning leaves, hikers can look for birds and other wildlife at the 270-acre sanctuary. A round-trip hike spans 1 mile, and there’s also a Nature Center open from 9am-5pm Tuesdays through Sundays. Take note that dogs are not allowed and parking can be tricky. Fall foliage isn’t the only thing you’ll see at the walkway above Croton Dam—you’re also afforded some stunning waterfall views. First-timers should know that this isn’t a trip for those with a fear of heights, so acrophobics should look elsewhere. To access the dam’s walkway, head to the playground and take the trail that leads up the hill. You’ll traverse across a few switchbacks to a stone bridge, which brings you directly above the spillway. 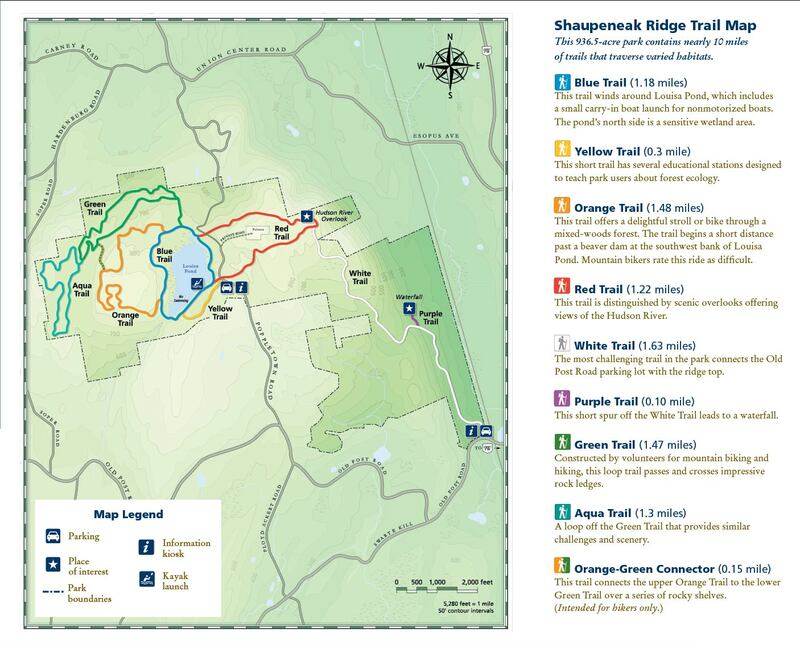 Situated on the Shawangunk Mountain ridge in Ulster County, Minnewaska boasts 35 miles of carriage roads and 50 miles of footpaths, offering a trek for nearly every skill level. The 1.2-mile Awosting Falls Carriage Road to Lake Minnewaska is a popular trip for families, providing plenty of fall foliage and waterfall views. Strollers, bikes, and leashed dogs are allowed. Take note that there’s a $10 parking fee. Another reader recommendation, this 937-acre Ulster County destination features 9 miles of trails with both Hudson River and waterfall views. Families should check out the loop around Louisa Pond. While not traditionally viewed as a hiking spot, you’re sure to do a ton of walking at this 500-acre outdoor sculpture garden. In addition to the magnificent art, the grounds are surrounded with mountain views and plenty of turning leaves. Beware that October is Storm King’s most popular month of the year, according to the venue, and visiting during off-peak times is highly recommended. The venue is open every day except Tuesday. This 1.28-mile-long pedestrian bridge linking Dutchess and Ulster counties is an ideal walk for families who require a stroller or wheelchair. (An elevator is available from 9am until about an hour before sunset.) The elevated walkway suspends you more than 200 feet over the Hudson River, providing plenty of Instagram opportunities. Feeling particularly energetic? Take the Walkway Loop Trail, which ranges from 3.8 to 4.4 miles depending on where you park. You can also build in a trip to the Mid-Hudson Children’s Museum or spend the day in Poughkeepsie. Families can hike at the 640-acre Westmoreland 365 days a year. There are 13 interconnected marked trails spanning 7.5 miles, with a variety of difficulty offered. Dogs are not permitted.